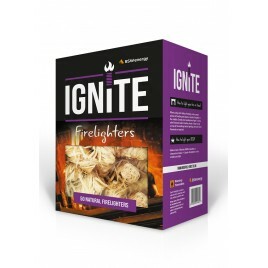 New Ignite Firelighters are the natural choice for your fire or stove. Made from renewable, untreated wood shavings dipped in wax they are easy to use and it only takes one firelighter to get your fire or stove going. The natural choice for your wood burning appliance. Ignite natural firelighters are made from renewable, untreated wood shavings dipped in wax, they’re easy to use and it only takes one firelighter to light a fire.Long BurnOdourlessEasy to LightClean and Convenient50 firelighters per packSuitab..